The House chamber was full Tuesday as Gov. Terry Branstad delivered his Condition of the State address. 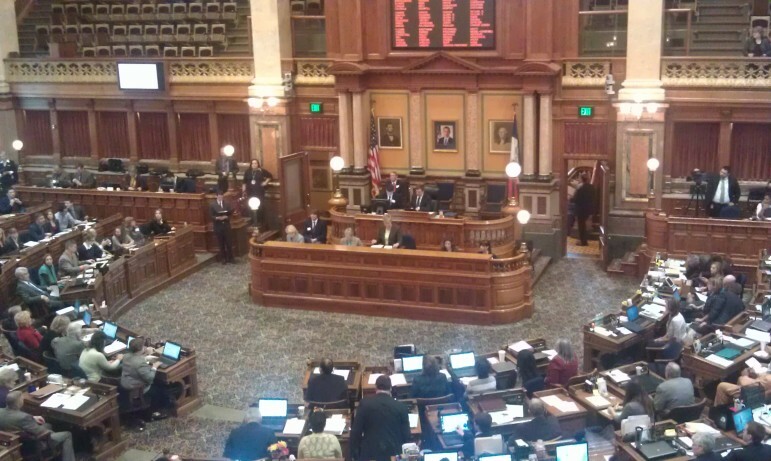 Opening session at the Iowa House of Represenetatives, Jan. 13, 2014. Iowa Gov. Terry Branstad committed specifics Tuesday morning to priorities he has been talking about leading up to Monday’s start of the state’s 2014 legislative session. They include exempting military pensions from state income tax, granting veterans in-state tuition at Iowa’s community colleges, freezing tuition at public universities and increasing apprentice and job training for college students in a bid to keep their debt down. Also in Branstad’s legislative proposals, revealed in his annual Condition of the State address, are providing tax incentives for bringing high-speed Internet access to underserved parts of Iowa and giving parents and schools more tools to battle bullying. Notably missing was any mention of raising the minimum wage, an issue repeatedly raised by Democrats during the opening session on Monday. Branstad’s address, delivered from prepared remarks made available for the start of the speech, was upbeat before the joint session of the General Assembly. “Today it is my duty and honor to report to you on the condition of our state. And I am here to tell you, with great pride: the State of Iowa is working,” he said. Rep. Ruth Ann Gaines, D-Des Moines, said she found the speech to be both uplifting and inclusive. “He spoke about this being a good session to work together and get things done and I hope we can do that. I hope we don’t get bogged down. The governor himself seemed more together, more on target and focused,” she said. It was a speech laden with references to working together but easily discernible pitches in this election year to give credit to changes he brought to the governor’s office three years ago after ousting former Gov. Chet Culver in the 2010 election. Branstad ran through a litany of benchmarks to make his point: a 4.4 percent seasonally adjusted state unemployment rate, enactment last year of property tax cuts, growth in personal income, improved performance by schools and students, a health care delivery strategy that includes recruiting doctors to Iowa and revamping the state’s health care program for low-income Iowans so that it reaches more people. He also said Iowa has stable, biennial state budgets and a healthy treasury. “These are budgets that hard-working Iowa taxpayers can depend on, budgets that work for Iowans by prioritizing education, economic development and job training,” Branstad said. Branstad’s proposed fiscal 2015 budget, released Tuesday, calls for a state appropriation of $7.5 billion. Of that, $7 billion would be for general fund spending. Another $298.6 million would pay for items such as Medicaid, the state’s skilled workers’ fund and the state’s share when needed for supplementing federal disaster funding. Appropriations for Iowa’s Rebuild Iowa’s Infrastructure Fund would total $135.7 million and $60.4 million would be used for technology. 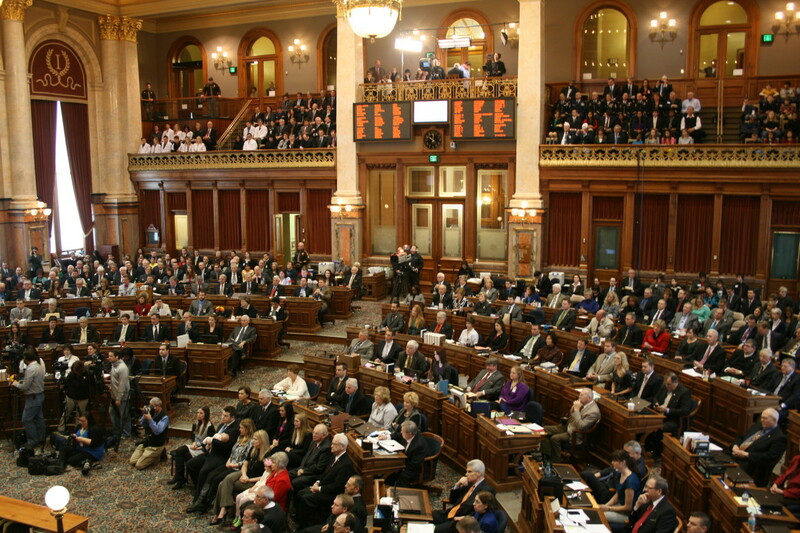 Branstad re-emphasized a theme he and other legislators, particularly Republican leaders, hammered home on Monday when the legislative session opened – that last year’s General Assembly set the stage for cooperation between Republicans and Democrats on important issues. “Because of our hard work last legislative session, Iowa’s economy, educational system and health are moving forward,” he said. He urged legislators to attack the state’s problems by working hard, together “to make things better than we found them. Rep. Vicki Lensing, D-Iowa City, said credit belongs to legislators for the give and take of last session. “It’s kinda’ the dance we do to get to the end,” she said. The legislative initiatives are packaged in specifically named acts. In the Home Base Iowa Act, Branstad seeks to support Iowa veterans through legislation that would push the state’s public universities and community colleges, and professional licensing boards to give veterans credit for training and work done in the military. For example, a nurse in the military would be eligible for a nursing’s license in Iowa. Sen. Bill Dotzler, D-Waterloo, said veterans can help alleviate the skilled workforce shortage. Branstad’s proposal to drop the state income tax requirement on veterans’ pension payments would remove $10 million from state revenue, David Roederer, Branstad’s Department of Management director, said. Would fully exempt military pensions from state income tax. Governor calling on the State Board of Education to create a uniform policy granting automatic in-state tuition to veterans, their spouses and dependents at Iowa’s community colleges. The Regents universities already have such a policy in place. Direct each occupational licensing boards to adopt rules allowing credit for military training and experience in the licensing process. Contains targeted, time-limited, and geographically-limited tax incentive to encourage build-out of ultra-high speed Internet capabilities. Exempts from property tax broadband equipment and infrastructure installed or constructed in unserved or underserved areas by Dec. 31, 2018. Repurposes the Iowa Communications Network to allow private providers to purchase (called a move toward ICN 2.0). Freeze tuition at the University of Iowa, Iowa State University and University of Northern Iowa another year, after doing so for the current school year. Creates a parental notification requirement, directing schools to inform parents if their child is involved in a bullying incident. Gives schools discretion to respond to bullying that takes place off of school grounds if two prescribed conditions are met. Triple funding for apprenticeships that provide focused, hands-on training and a paycheck while in school. Dotzler said he supported the proposed Home Base Iowa Act, but that some aspects, especially how to help veterans with mental health issues, were missing. “When you look at our veterans coming back with post traumatic stress, if we want to help veterans integrate back into society, we need to help them with mental health issues,” Dotzler said. As vice chair of the veterans standing committee, Rep. Sandy Salmon, R-Janesville, said she was glad Branstad proposed the Home Base Iowa Act but was unsure of it will pass through the House. “We passed it out of our committee so I’m hoping they’ll get something done with that,” Salmon said. Branstad also proposed the Bully-Free Iowa Act of 2014, which outlines steps schools would have to take on behalf of children subjected to bullying, and their parents. Pablo Haake, 17, of Davenport Central High School, attended the Condition of the State address with other members of the State of Iowa Youth Advisory Council. The council is a group of students throughout the state who speak with legislators about issues important to young Iowans. This year the students are focused on bullying. Haake said he was pleased the governor mentioned cyber-bullying. “But I do recognize that this year is going to be a difficult year for this issue because it’s an election year and more budget focused year, but I know it’s our responsibility to keep working with him on this” he said. Branstad’s proposed budget includes $19 million for the Board of Regents to make up for income a tuition increase otherwise would raise. The state regents, who run the University of Iowa, Iowa State University and University of Northern Iowa, have sought that as part of their vote late last year to freeze tuition. Gaines, who works in education, said she supports the tuition freeze. “I have received letters from kids from the University of Iowa thanking us. So I know it’s working and helping. It provides stability, not only stability now, but for the future. College debt is so huge. I’m glad I’m not going to school now because I wouldn’t be able to do it,” she said. Branstad also is calling for educating students better about the costs of money they borrow and pumping money into the apprenticeships through the Iowa Apprentice and Job Training Act. That act would triple spending for the 260F worker training program for apprenticeships in which college students can begin to earn wages while training on the job. “We need to reinforce with our student that if they borrow, they need to borrow only enough to pay the bills,” he said. Meanwhile, apprenticeships now allow the state to train workers quickly and effectively. Lensing said one item missing from Branstad’s speech was raising the minimum wage, a key issue raised by Democrats on Monday. Gaines also noted the absence of minimum wage, which she said is necessary for working families and “long overdue.” But Branstad’s point about improving jobs was encouraging, she said. Branstad’s proposed budget calls for meeting spending obligations in the coming years for education reform programs and property tax relief that were adopted last year. For example, his proposed budget calls for spending $57.1 million on education reform in fiscal 2015, up dramatically from $6.8 million this year. The spending obligations will draw down Iowa’s ending balance — the budget surplus that draws attention during spending arguments in the Statehouse. The balance was $928 million at the July 1, 2013, start of fiscal 2014 but is projected to drop to $882 million by the end of this fiscal year and $723 million at the end of fiscal 2015, Branstad’s office said. Roederer told reporters the state has had to build revenue in advance of the education reform and property tax obligations. “That’s why we were so vocal about making sure we have a sizeable ending balance,” Roederer said. One item that Republican and Democratic leaders have shown agreement on previously also was in the speech. Branstad called on legislators to pass a bipartisan resolution in support of maintaining a robust Renewable Fuels Standard. The Environmental Protection Agency has proposed reducing the level of biofuels required in that standard. Though House and Senate leaders offered different proposals Monday than Branstad did Tuesday, Senate Majority Leader Michael Gronstal, D-Council Bluffs, said the varying agendas still can fit together. IowaWatch covered this story for The Hawk Eye (Burlington) and Council Bluffs Nonpareil.